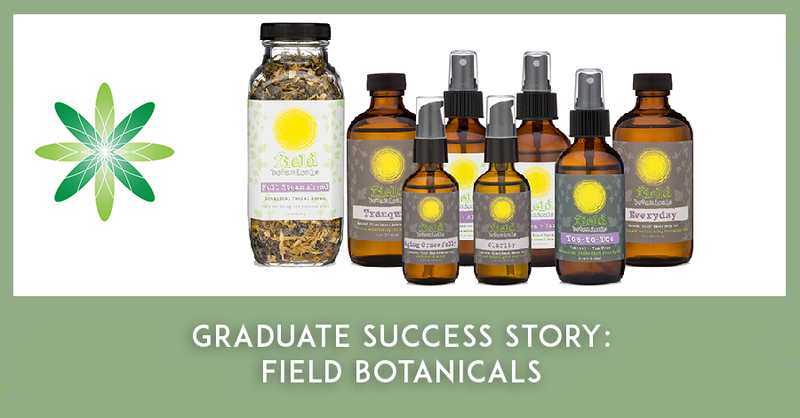 In this latest graduate interview, we speak to Jennifer Tinsley, Founder of Field Botanicals. 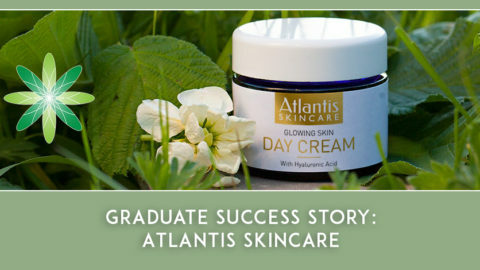 Formula Botanica’s graduates are all around the world and formulate all sorts of different natural and organic skincare. Field Botanicals are developed with plant based, all natural botanicals that heal, protect and nourish the body, mind and soul. Hi Jennifer, please tell us a bit about who you are and where you’re from? I’m a Chicago-born girl who was raised in the southern United States – I grew up in Louisiana and have lived in Florida, Georgia, and now South Carolina. Field Botanicals is a relatively recent endeavor for me and quite a different professional path than the one I was previously on. I have a Fine Arts degree, and for 20 years I worked in regional planning and community development, so you could say I have multiple passions. Personally, I’ve been a vegetarian since the age of 14, but for the last three years have been a vegan. I’m a bit obsessed with wellness and health care, and how diet affects the skin, so that played a big part in starting up Field Botanicals. I’m definitely a “solopreneur” – I handle everything from product creation to marketing to accounting to website design. 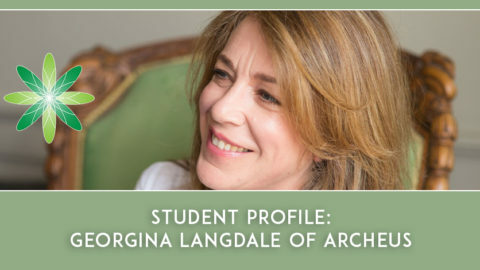 It certainly has its challenges, but I have a tribe of some very talented people who don’t mind me pestering them all the time if I am working with a skillset I don’t have much experience in, such as photography. I plan to have a team assembled as soon as financially feasible as my business grows. It’s challenging doing it all myself but a necessity when first starting out. I certainly have learned a lot about many aspects of running a business! 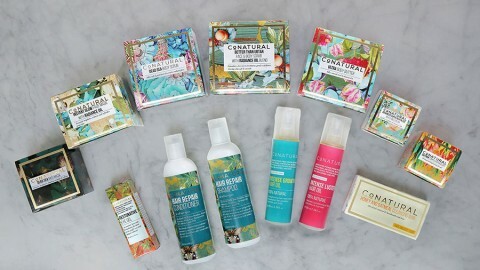 Where did the name Field Botanicals come from and where did you get the inspiration from for your brand? 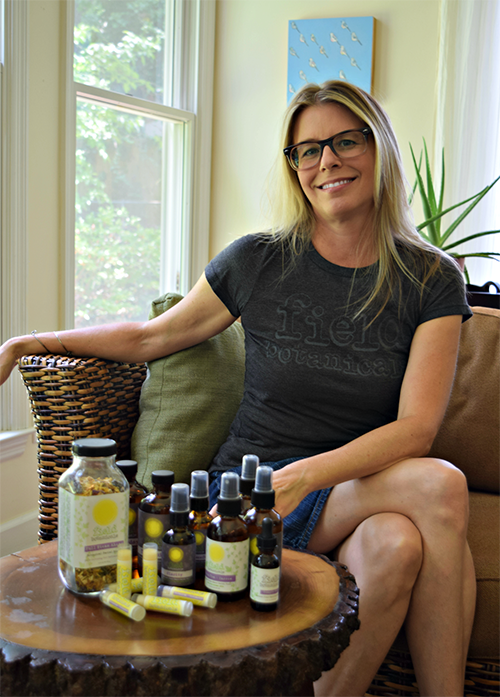 “Field” is actually a family name on my father’s side, but what a great word it is for an organic skincare business! For me it’s personal, but from outside perception I hope to evoke a feeling of being in a field of plants or flowers, regardless of where you are. I like to think it brings the field to the city and brings the user the benefits of plants no matter where she is geographically. It’s important to me that Field Botanicals is recognized as being vegan and cruelty free. My products were recently Leaping Bunny certified, which was an important milestone in the growth of the business. 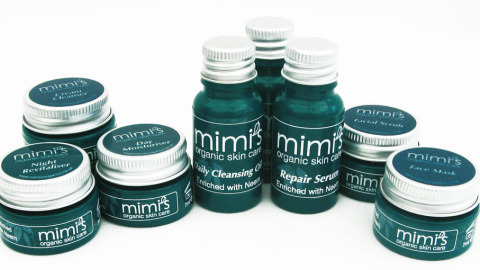 What type of skincare products do you sell at Field Botanicals and which one is your favourite and why? Field Botanicals focuses on vegan, cruelty free facial and body oils with inherent plant based benefits as well as aromatherapeutic benefits. I also make a facial steam, toners, a soothing temple oil, a lip balm (vegan of course), and a foot spray. All of the products are blends of plant based oils, essential oils, and other pure botanical infusions, hydrosols, and extracts. 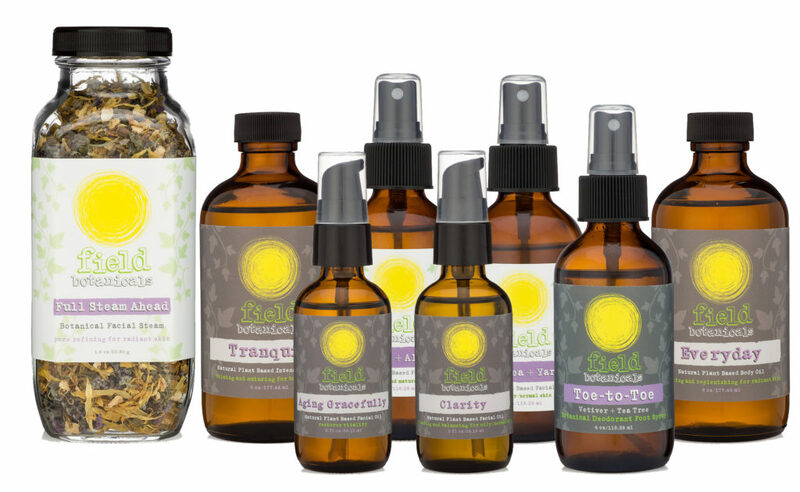 All of the carrier and supplemental oils in the facial and body oils are certified organic. The facial steam ingredients are all organic, and I grow the lavender myself. All ingredients are also ethically sourced, which means the ingredient sources certify that their growers use fair labor practices and environmentally responsible ethics. 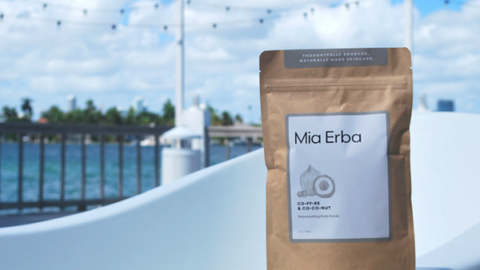 None of my products have any synthetic additives, colors, preservatives, or fragrances. As for my favorite, that’s such a difficult question for me to answer. They’re all my babies! I have my personal favorites because they work for me, but everyone’s skin has different needs so my favorites are not necessarily my best sellers. I’ll start with my most popular products – that would be the Everyday Body Oil and the Toe-to-Toe Botanical Deodorant Foot Spray. 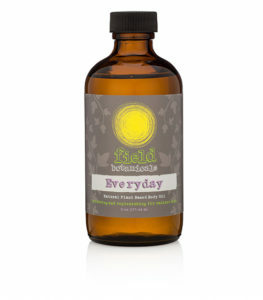 The Everyday Body Oil is a very lightly scented body oil that is mild enough to use everyday, as the name suggests. The base is a blend of organic grapeseed, sweet almond, and apricot kernel oils, which provide a quick absorbing moisture and a nice sheen on the body without being greasy. People are immediately attracted to its subtle scent, which absolutely thrills me since I just abhor artificial fragrances. They’ll pick up a bottle and not be able to put it down because they are entranced by the subtle aroma of Roman chamomile, frankincense, geranium, lavender, palmarosa, ylang ylang, neroli and patchouli. It’s such a joy! The Toe-to-Toe Botanical Deodorant Foot Spray is a product I developed last year primarily for myself, but after much experimentationI came up with such a unique product that I wanted to test it in the market. And living in the southern U.S. (with a lot of sweaty feet!) it became my best seller seemingly overnight. It’s a foot tonic that works to combat foot odor caused by bacteria, using tea tree, thyme, lemon, grapefruit and peppermint oils. But the key is vetiver, which is both grounding with its woody scent, and deodorizing. The base is a witch hazel tincture, so it does contain a small amount of alcohol, but aloe is added for the moisturizing effects. Of course in the U.S. the FDA limits what I can claim as far as it being naturally antibacterial and antimicrobial, but I can say that it does work to greatly reduce foot odor. My personal favourite is the Clarity Facial Oil, because it has done wonders for my skin. My skin produces a lot of oil (or used to when I was younger) and was prone to breakouts. I have to say that a dairy-free diet really helped, but that in combination with the oils in Clarity has made quite a difference. I think one of the biggest misconceptions in facial skincare is that you have to scrub and scrub oily skin with drying soap, and that applying topical oils makes the skin oilier. Well, as you know and Formula Botanica students quickly learn, that is the opposite of the truth. Stripping surface oil from the face only causes the body to create more sebum to replace what was taken off, and creates a vicious cycle. I am amazed at the number of people I discuss this with who are totally taken aback at the idea of putting oil on oily skin! 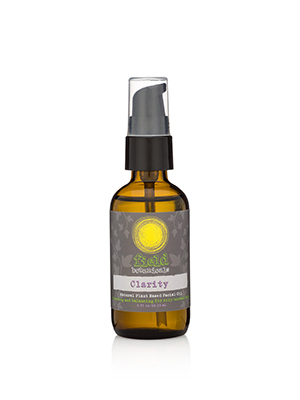 Clarity is formulated with a base of organic grapeseed, borage, pomegranate and calendula oils, which work very well balancing oily skin, and oils of lemon peel, patchouli, ylang ylang and rosemary which also work to balance sebum. It smells very floral and citrusy so is nice and refreshing in the morning. As my skin ages – I’m 47 – I like a more moisturizing oil at night, so I switch to Aging Gracefully before bedtime. I’ve received the Diploma in Organic Skincare Formulation and Certificate in Natural Cosmetic Preservation. 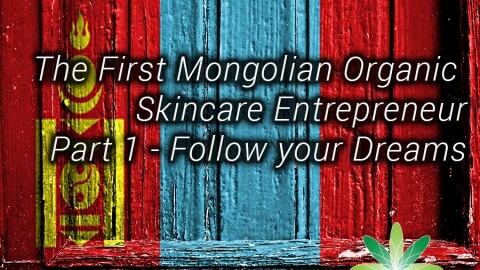 I think both of those courses are absolutely necessary prior to launching an organic skincare brand. I had already launched Field Botanicals when I started the courses, and I ended up doing some backpedaling and reformulating, so it would have saved me a lot of time and money if I’d been more patient. I’m about halfway through both the Advanced Diploma in Organic Cosmetic Science and the Tutor Training Program. I hope to teach DIY classes and possibly some natural perfume making classes in the future. I’ve had a lot of questions regarding DIY classes for aromatherapy and have already begun a list of potential students. I’ve always been interested in health and wellness. As a vegan, it was important to me to be able to create vegan and cruelty free products, so that’s my niche market. I always say that I’m going to live to a healthy 110, and I’m not joking! A plant based diet, physical exercise, and mental wellness are what I aim for daily. I’ve focused on these elements my entire adult life but never really thought much about skincare until 2013, when I struggled with a bad case of eczema for the first time in my life. I didn’t even know what the rash covering my arms and legs was. I had to Google it. I am fortunate to have an integrative medicine doctor literally five minutes from my house, so I went to him for help. We determined the trigger was a round of antibiotics I had taken a couple of weeks prior, possibly causing a leaky gut that triggered an autoimmune reaction manifesting in my skin. He recommended a lot of integrative remedies including an elimination diet, meditation, probiotics, self hypnosis, yoga, massage – you name it. I did it all. For a topical treatment, he recommended a homemade olive oil infusion with calendula, chamomile, lavender and licorice root. While I can’t credit the infusion alone with healing my eczema, it was soothing and made me think about what I was putting on my skin. I then started reading everything I could on herbalism and aromatherapy – Rosemary Gladstar, Jeanne Rose, Valerie Ann Worwood, Robert Tisserand. I was hooked! 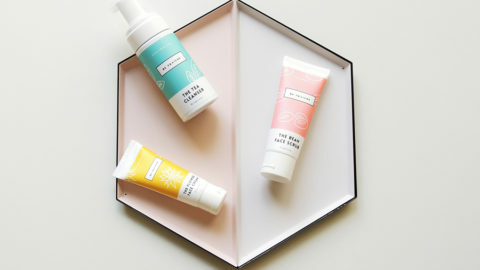 After a couple of years of research, I launched Field Botanicals as a vegan, cruelty free, mostly organic alternative to conventional skincare products. I also wanted to make an affordable product that had maximum efficacy, since there are few women who can afford an $80 facial serum. Oh, and my eczema cleared up completely within 12 months and has not returned! I never had a problem with enthusiasm or taking time to formulate, formulate, formulate. The hardest thing was not seeing immediate returns after so much time and and the bulk of my personal savings was put into the launch. I’m both a dreamer and a doer and I had a bit of difficulty with the dreamer part! But that’s just the life of a start-up and I am much more patient now. I celebrate every customer and am grateful for every chance I get to talk about skincare products. Making money is good, and is a definite goal and it certainly needs to happen to keep a business going. 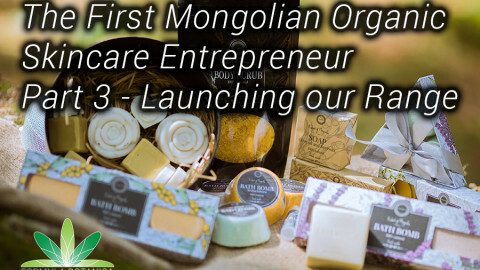 But I have a genuine excitement and childlike enthusiasm for helping women discovery skincare products that not only improve the health and look of their skin, but empowers them to be in control of their health and wellbeing. Planning, patience, and partnerships. At first, as you learn how to make all these wonderful beauty products, you’ll want to make and sell everything. I started out with 14 products, added 3 to make it 17, and have since scaled back to 10. Let’s just say that your enthusiasm should be bridled just a bit to fit within a realistic strategy. You really need to have a business plan that identifies your market audience and their needs, and the steps and costs involved with creating products for that market. Make all the other stuff for yourself and your friends, but realize that it’s a business and you are not making products for yourself, you are filing a market need that may not identify with your own desires. So that’s the planning part. The patience comes from the realization that you are going to be putting a lot of blood, sweat and tears (well hopefully not blood, but copious amounts of sweat and tears!) into this business if it’s really going to be a game changer. But nothing happens overnight. You aren’t going to launch your website and suddenly get hundreds of orders, you won’t go to a market or pop up show and have people lined up to give you money. Savor the minor victories along the way and realize that good things will happen with perseverance and patience. You can believe in your products, but if they aren’t selling, then reevaluate and chalk it up to lessons learned. Don’t get discouraged if you are not selling a lot – green beauty is a growing market but there are a lot of players in the field. Concentrate on what makes your company unique and focus on that. I remember right after I launched in July 2015, Jana Blankenship of Captain Blankenship commented on one of my Instagram posts. I think I only had 50 or so followers then. Jana has been doing the green beauty thing for a while and she is very much an inspiration to me, so when I read her comment I did a little happy dance, yelping with joy. Celebrate and take heart in these little victories, because the little things matter and all count towards building your brand. And lastly, partnerships are so important if you’re a solopreneur like I am. Even if it’s just having coffee with fellow entrepreneur, you need a tribe outside of your family that you can bounce ideas off of. I went from 20 years of a 9 to 5 desk job to two years of Field Botanicals being my side hustle, to being a full time entrepreneur. It took some adjusting, and not just to the family budget! When I went full time with Field Botanicals, I joined a co-working space and started attending meeting after meeting of local groups of small business owners, creatives and makers groups, chamber of commerce groups and the like. In just a couple of months I’ve made countless new connections and now have local resources for photography, videography, graphic design and marketing, and just moral support when I need it. I’m working with some great folks now on new collaborations that involve cross marketing our allied brands. So get yourself out there and pass out some business cards. Even if your business is online based like Field Botanicals, you’ve got to have a local tribe you can count on.